In her defense, just because parents and educators might adopt her language of mindsets, it does not mean that they are doing the work needed to actually create environments the support Growth Mindsets. Dweck said in an interview in 2015, “We’re finding that many parents endorse a growth mindset, but they still respond to their children’s errors, setbacks or failures as though they’re damaging and harmful… If they show anxiety or over-concern, those kids are going toward a more fixed mindset.” Like many other things, a compelling description lost its efficacy when it was turned into a prescription. And even as a description, I do find her typologies helpful. Whether their offering of “strange fire” was idolatrous or just their being creative or playful, their immediate death made it clear that in this situation falling was failing. For all of us success and failure need to be clearly defined if we hope to achieve it. The new research it saying that it is not clear that we can transform someone from a Fixed Mindset to a Growth Mindset. It is also not clear if that effort will itself lead to success. That said, I do think that such a harsh response to falling would not encourage anyone to seek challenge in order to grow. While a critical reading would claim that God was acting as a horrible parent, a more charitable reading would claim that God is setting out the exception which is demonstrating the rule. Falling is not allowed in the Tabernacle or Temple, but it has to tolerated if not celebrated everywhere else in that we are still learning to walk. Shabbat Nachamu – the Shabbat of Comforting takes its name from the haftarah from Isaiah ( 40:1-26) that speaks of “comforting” the Jewish people for their suffering. There we read, “Comfort you, comfort you My people, said your God.” ( Isaiah 40:1) This haftarah is the first of seven haftarot of consolation leading up to the holiday of Rosh Hashanah. It occurs on the Shabbat following Tisha B’Av. It is understood to be the start the national healing process. Like no time in recent history we really need this Nechemta- comfort. But with such suffering now in the world how might we make that shift to comfort? Recently I have been reading Dr. Carol Dweck‘s Mindset. It is a wonderful book in which she uses her research in psychology to outlines two typological mindsets. Mindsets are beliefs about yourself and your most basic qualities. Are these qualities simply fixed traits, carved in stone and that’s that or are they things you can cultivate throughout your life? People with a Fixed Mindset believe that their traits are just given. People with a Growth Mindset, on the other hand, see their qualities as things that can be developed through their dedication and effort. 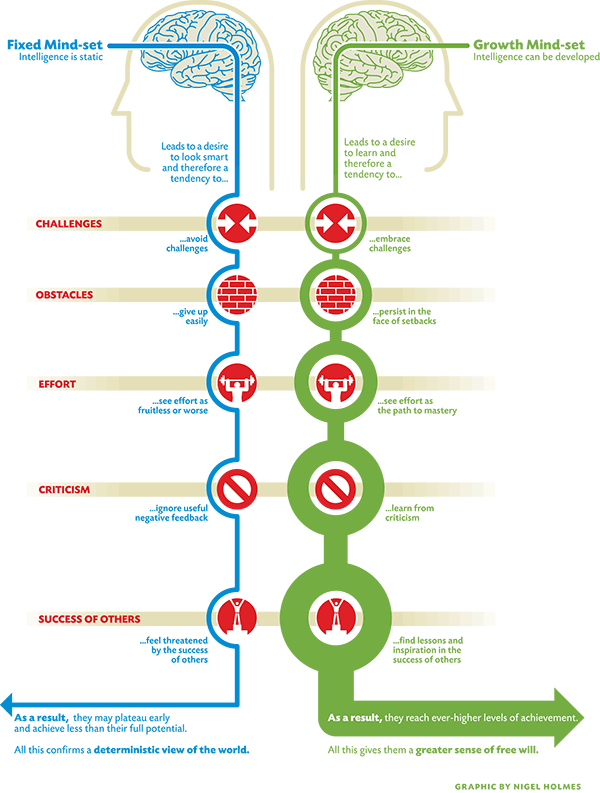 Below you can see a great graphic explanation of these two mindsets. Dr. Dweck argues that having a Growth Mindset is the secret to being successful in everything including sports, parenting, business, school, teaching, coaching, and relationships. As a nation if we had a Fixed Mindset and we experienced the set back of Tisha B’Av or the current attacks by Hamas in Gaza we would have just given up and been done. We would not have lasted as we have throughout history. But instead, we choose a Growth Mindset. With Shabbat Nachamu we are invited to work and developing our relationships with each other, the world, and God. There’s nothing I can’t do! I think it is worth listening too. If we have a Growth Mindset and we are trying to answer John Newman’s question after Tisha B’Av the answer has to be that there’s nothing we can’t do. With Shabbat Nachamu is seems that God is willing to love us again. And if we work on it, in seven weeks we will be back in God’s good graces. When it comes to how we relate to each other, our neighbors, our friends, and even our enemies there is much to do. I hope we will recover a Growth Mindset regarding this crisis in the Middle East. It is time to repair, prepare, and grow. With the right Mindset there is nothing we can’t do. I hate the word “hate”. How do I respond what I hear someone say, “I hate someone”? It is such a strong word to use so freely. But if we pause, as I think we need to, we might realize that we do not actually mean it. What would it mean genuinely to hate someone? What would someone need to do for us to hate them? While I know that camp is a bubble filled with love, it is hard to ignore all of the hate that is in the world right now. It all started when Balak saw the Israelites’ success over the Amorites. From there it seems that he quickly moves from fright, to disgust, to teaming up against the Israelites, to dehumanizing the Israelites calling them oxen, to enacting a plan to bring them down. I am sure we can all relate to this cycle. How often do we respond well to the success of our friends and friends let alone the success of strangers or even enemies? We are often stuck in a fixed mindset. For some reason it is hard for us to use these experiences to inspire ourselves to work harder. Hating them seems easier than dealing with our own deficiencies. But in the end as we curse other people’s success we ourselves miss out on the blessing of growth. Jewish ethics are founded on the ideal that everyone is created in the Divine image. There is a part of every person that is a mystery of what potential goodness and Godliness may be hidden within them. To hate someone is to deny the unique nature of their creation. In trying to curse them some part of ourselves is diminished in not maintaining the search for the hidden goodness within them. It is our job to explore this mystery in everyone, maybe even more so for the people we hate or claim to hate us.